Item # 299789 Stash Points: 2,799 (?) This is the number of points you get in The Zumiez Stash for purchasing this item. Stash points are redeemable for exclusive rewards only available to Zumiez Stash members. To redeem your points check out the rewards catalog on thestash.zumiez.com. Get gloves this winter that you don't have to take off to use your phone or adjust your bindings with a pair of Roxy Jetty Black Snowboard Gloves. Touch screen compatible and ultra lightweight, these gloves still have a three out of three warmth rating by the manufacturer thanks to 170g of Warmflight® insulation. DRYFLIGHT® inserts keep the gloves breathable and HYDRO-TEX® provides excellent waterproofing to keep your hands dry no matter the weather. 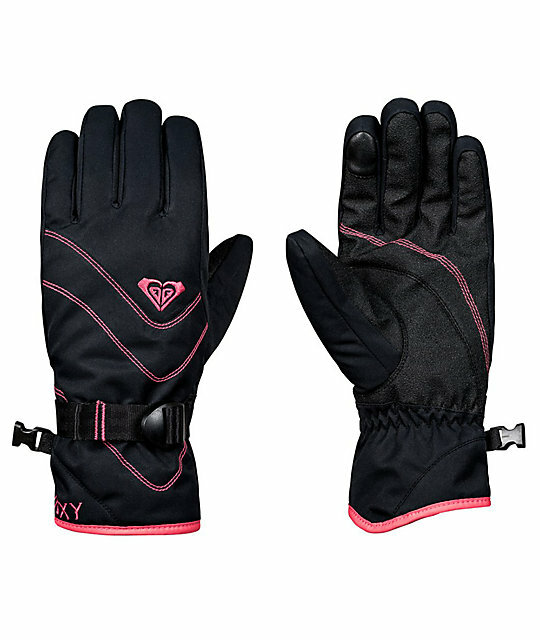 No more numb fingers this winter, get a pair of Roxy Jetty Black Snowboard Gloves. Jetty Black Snowboard Gloves from Roxy. 100% polyester twill with Durable Water Repellent (DWR) to prevent moisture saturation. Black with pink stitch & seam details. Palm: A black durable rubber and PU palm is textured for grip and offers water-resistance. DRYFLIGHT® Insert: long-lasting weather protection and optimal moisture & heat management. Touch Screen Tech: Index finger features a touchscreen compatible material for easy use. Liner: Soft & fuzzy brushed tricot lining provides warmth & softness without sacrificing mobility. Cinched elastic cuff with adjustable webbing wrist strap.